If you're thinking about buying or selling a home in the D.C. metro area, you'll want to read this. A new report from The Stephen S. Fuller Institute examines demographic and economic data from the local market that impacts that decision. The Fuller Institute is the premier source for information and analysis of the Greater Washington region’s economy. The housing market is responsive to both economic and demographic factors. Since the recession, economic factors have played the largest role in the Washington region. However, in upcoming years, demographic trends will put new pressures on the housing market. As Baby Boomers (54 to 72 year olds) transition to new lifestyles, many home owners in this generation will decide to sell so they can downsize or move. 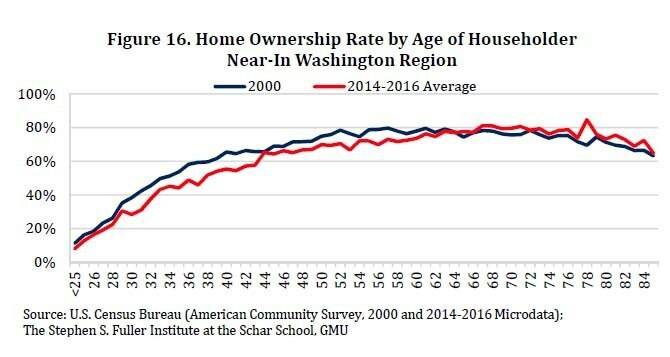 Because this generation owns about 40 percent of all homes owned in the Washington region, even a modest change in preferences could have a big effect on the housing market. The increased inventory that would result from even a modest “Baby Boomer sell-off,” combined with rising interest rates and high levels of student debt among potential buyers, has the potential to moderate sales prices. As a result, the near-term housing market has the potential to be more dynamic than in past years. Some longtime owners who wish to sell may have difficulty attaining the price gains they witnessed in their neighborhoods during recent years, when inventory was limited. In neighborhoods with a large number of longtime owners, the turn-over may happen relatively quickly, compounding the potential effect on sales prices. Potential buyers are likely to continue to be highly selective. As always, homes that fit their criteria, driven both by location and the features, will sell quickly and potentially gain in pricing. Altogether, the sales patterns and pricing in upcoming years will be highly spot- and unit-specific and neighborhoods with a large share of longtime owners will have the most volatility. The takeaway: if you are considering selling your D.C. area home to downsize or relocate to another area, the report indicates it will be better to act soon rather than wait. When empty nesters finally do decide to make their move, it will have a big impact on the housing market. Click here for a more in-depth look at the Fuller Institute’s report on D.C. area economic and demographic trends impacting the house market, sponsored by EYA.